The motorhome has a beautiful island bed at the rear for mum&Dad and then a double cab bed that comes down over dinette area. Self contained great to see the U.K. especially the south west Cornwall and Devon as we are based in Bristol. Beautiful BRAND NEW motorhome rental. A 4 berth low profile 2018 specification motorhome with a front dinette/lounge which makes good use of the driver and front passenger swivel seats,side facing single bench with a 5th seat belt and a forward facing bench seats fitted with seat belts,above is a neatly concealed electric drop down double bed.Central kitchen has a 3 burner gas hob,grill,stainless steel sink and a 3 way fridge with seperate (URL HIDDEN) the rear is the dedicated spacious end bedroom with its height adjustable fixed island bed and ensuite facilities with wc/washroom on one side and a seperate shower cubicle on the other.This also comes with cab air con,crusie control,electric de-icer for rear view mirrors.Ford engine with audio system,bluetooth,heating and hot water system,Led lighting,cab panoramic skylight,central locking for the rear of the vechicle is a good size garage accessible from both sides of the vehicle. Towels and beddpack is charged at £12.00 per bed. Bike rack included for 2 bikes but please advise if needed. EXTRAS ADDED:- solar panals,alarm system,TV with dvd,bike rack and barbecue points. PLEASE NOTE IN HIGH SEASON THE MINIMUM DAYS REQUIRED FOR HIRE IS 7 DAYS. Please can you empty toilet compartment prior to returning the vehicle after hire. Supplied with a full tank of petrol please return in same manner. Transfers available from local aiports, train and bus stations. Please email for a quote. Please note we have our own self drive hire insurance. We will require the following information after the booking is made. We need to do a dvla check on each driving license. 5. Signed rental agreement which we will send you to sign andagree to. 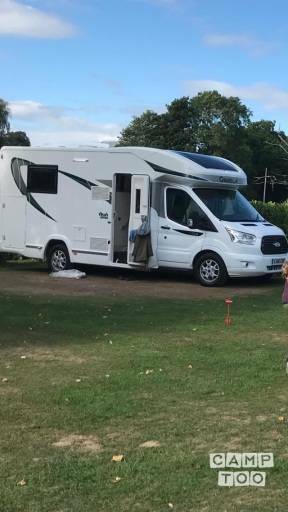 We will also need to take a security deposit against any accidents and damage done to the motorhome the price will be £1000 which can be forwarded via bacs 24 hours before travel. The motorhome is clean and tidy I except the motorhome to be returned in the same condition please. The motorhome will be filled up with a full tank please return in the same manner. The Gas tank is full make sure when return the tank is full.